Seven years after ‘fighting to the death’: Who was the Post’s source? It will be seven years tomorrow since the Washington Post published its erroneous front-page report about Jessica Lynch, the Army private whom the newspaper had said “fought fiercely” in an early engagement of the Iraq War. “‘She Was Fighting to the Death,'” the Post‘s headline said of Lynch, then a 19-year-0ld supply clerk in the Army’s 507th Maintenance Company. The Post cited “U.S. 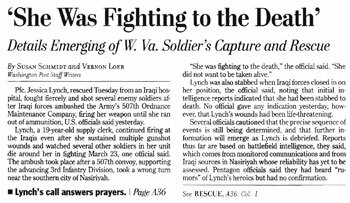 officials” who otherwise were unidentified as saying Lynch had “continued firing at the Iraqis even after she sustained multiple gunshot wounds and watched several other soldiers in her unit die around her in fighting” at Nasiriyah on March 23, 2003. None of it was true, however. Lynch never fired a shot at Nasiriyah; her rifle jammed during the attack. She suffered shattering injuries when a rocket-propelled grenade struck her Humvee, causing the vehicle to crash. But she wasn’t shot. The Post, though, has never disclosed identity of the source or sources for its bogus “fighting to the death” report, which was published April, 3, 2003. Over the years, speculation has been that the U.S. military leaked the hero-warrior tale about Lynch. But one of the reporters on the story, Vernon Loeb, has said the Pentagon wasn’t the source. So who were the Post‘s sources? Who supplied the erroneous details about Lynch? When I reached him by phone in 2008 to talk about the Lynch case, Loeb hung up on me. Krakauer’s book identified no specific sources for its claims about Wilkinson, who at the time of Lynch’s capture and rescue was director of strategic communications for General Tommy Franks, then the commander of U.S. forces in Iraq. I recently spoke by phone with Wilkinson, now a managing partner for the Brunswick Group in San Francisco. He vigorously disputed Krakauer’s account as “factually incorrect” and insisted that “not one shred of evidence” links him to leaking the erroneous report to the Post. “Tommy Franks would have killed me” had he been the Post’s source for the erroneous report about Lynch. Wilkinson’s denial has the ring of authenticity, especially so his point about Tommy Franks. The tenor of Franks’ memoir, American Soldier, makes it clear that Wilkinson’s subordinate and advisory role would have ended abruptly had he crossed the general. So seven years on, the Post‘s bogus report about Jessica Lynch reverberates still.